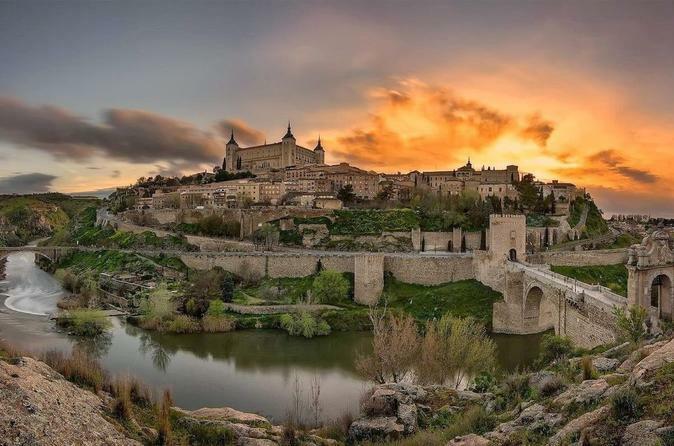 Depart Madrid in a comfortable tour bus while a travel assistant tells about the old capital of the kingdom of Spain and the city of World Heritage. You will have 6 hours of free time in Toledo, also known as the city of 3 cultures. See the amazing architectural treasures of the Jewish, Muslim, and Christian Cultures. Your tour bus will also take you to the most impressive lookouts of Toledo for panoramic views. On the the way to Toledo you will be accompanied by a guide assistant who will tell you the most astonishing facts and legends of the city. With the viewing of a documentary, you will discover the wonders of Toledo which was declared a Heritage of Humanity by UNESCO IN 1986. In addition, you will be provided a map of Toledo with the main tourist attractions. The map will show you all the magnificent monuments that you can’t miss in your visit and will be perfectly prepared to enjoy the city by your own. Your tour includes a panoramic tour. You will take a ride around the historic center and you will make two stops to enjoy a fantastic city view of Toledo. Once you are in Toledo, your assistant guide will accompany you to the main to Square Zocodover, the main meeting point of the locals and the best place to start to explore the city. You will have 6 free hours to see the Cathedral of Toledo, second richest Catholic building in the world after St. Peter’s Cathedral in Rome. Also visit the Alcázar, an impressive fortress; admire the most representative paintings of the famous artist El Greco. Enjoy the narrow streets of the old Jewish Quarter and don’t miss the Santa María la Blanca Synagogue, the Monastery of San Juan de los Reyes and the Mosque of the Christ of the Light. Lastly, don´t forget to taste the famous sweets marzipan made of almonds and honey!